A new online petition aimed at getting the Metropolitan Transportation Authority to install a bicycle path on the currently car-only Verrazano Narrows Bridge appears to have been generated by a transportation advocacy group outside of Bay Ridge, the Brooklyn community closest to the span, according to activists there. But Bay Ridgeites who have worked for years to get a bike path on the bridge said they are pleased to see the new effort and are not concerned about the possibility of someone else stealing their thunder. “I commend and congratulate anyone interested in getting involved with and resurrecting this cause and I welcome them to the fight,” said Justin Brannan, communications director for Councilman Vincent Gentile (D-Bay Ridge-Dyker Heights-Bensonhurst). Brannan said his boss has been involved in the effort to get a bike path for 15 years. “Councilman Vincent Gentile was among a group of elected officials in the late 1990s who tried to persuade the MTA to build a dedicated bike/pedestrian path on the Verrazano. While the community was supportive of the idea, we were met with resistance from the powers that be, who among other things, pointed to the high cost of creating such a passageway,” he told the Brooklyn Daily Eagle. “Much work went into this concept years ago and there is a lot of history behind this effort,” Brannan added. Charles Otey, who wrote the Pro Bono Barrister column for the Brooklyn Daily Eagle, is credited by many in Bay Ridge as the man who spearheaded the initial effort to get a bike/pedestrian path, which he called the “Verrazano Lifeway,” on the bridge. State Sen. Marty Golden (R-C-Bay Ridge-southern Brooklyn) is also a veteran of the bike path war, according to Ray Riley, his community representative. “The Senator has been a long time advocate for building a bike path on the Verrazano Bridge, since the days of the Fifth Avenue Board of Trade,” Riley said. Golden served as president of the Fifth Avenue Board of Trade in the 1990s. The latest effort, which has garnered a great deal of publicity, involves a petition posted on the www.change.org website. Addressed to Governor Andrew Cuomo, the petition advocates for the installation of a path on the outside lane on each side of the bridge. “Most of the 50-mile route can presently be used by pedestrians, cyclists, runners, and skaters. But the route is missing one critical link- bicycle and pedestrian access over the Verrazano Bridge,” the statement reads. 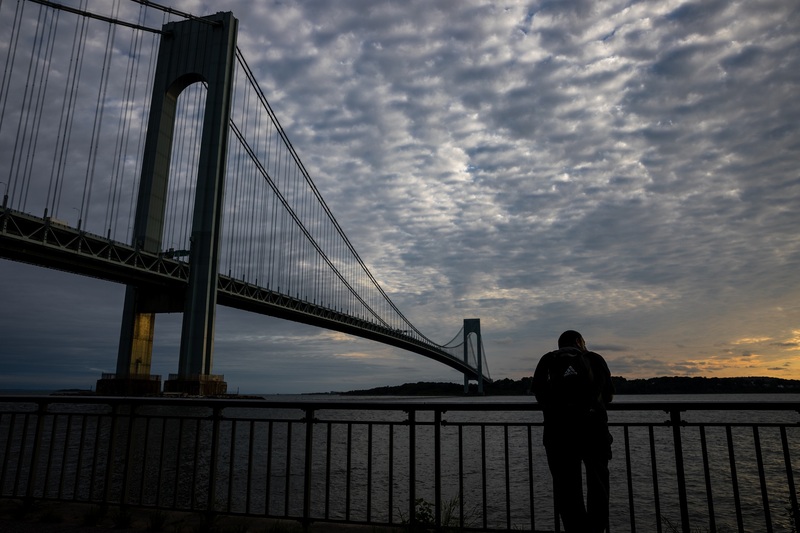 “In honor of the Verrazano’s upcoming 50th anniversary in 2014, we’re optimistic that the bridge will finally be completed, ultimately allowing for the full realization of the Harbor Ring,” the petition organizers wrote. The petition, which has garnered nearly 1,000 signatures, could be causing the MTA to re-think its longstanding opposition to a bike lane on the bridge. An MTA spokeswoman didn’t totally dismiss the idea of a bike lane when asked by the Staten Island Advance, according to an April 3 report in that newspaper. If the MTA does conduct a feasibility study, the first step toward building a bike lane, it would represent an about-face for the agency. As recently as six months ago, MTA representatives told members of Community Board 10’s Traffic and Transportation Committee that a bike path was a no-go, the Brooklyn Daily Eagle reported. OPINION: Never mind the bikes: subways to Staten Island!